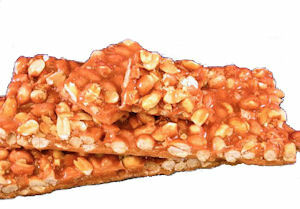 Delicious, crunchy, buttery peanut brittle. Handmade the old-fashioned way, this is sure to keep your mouth watering. Granulated Sugar, Spanish Peanuts, Corn Syrup, Butter, Salt and Baking Soda. May contain Wheat, Milk, Peanuts, Tree Nuts, Soybeans and/or Eggs.